Pinner Park Farm was a favourite destination in the early sixties when I used to stay with cousins in North Harrow. Milk from the farm’s Friesian and Jersey cows was delivered to local houses by horse-drawn float. Now the borough’s last dairy herd has gone. Fortunately, at Harrow School there are still cows to be found in the fields where Longhorns have replaced the familiar back and white Friesian dairy cattle. A hundred years ago Longhorns were almost extinct. Now new purposes have been found for them, and old-fashioned beef is welcomed on our plates. Go for a walk across the fields below Harrow School, beyond the new Astroturf and the tennis courts and you may well encounter a herd of wild looking beasts, beasts whose long horns and rough, speckled coats might make you keep your distance. Their long horns are a particularly striking feature and remind a passer-by of old black and white cowboy films. But these are not Texas Longhorns, which have Spanish and Brahmin blood. These new arrivals are as English as Robin Hood and are the descendants of the oxen which pulled carts and ploughs in medieval times. Now they are making a come-back as tools in conservation plans and as providers of tasty beef from rough grazing. Tim Perkins, the Harrow School farm manager explained that the farm’s sixty acres no longer provided a viable commercial unit. Now, local conservationists have provided advice and encouragement as the school seeks to conserve grassland areas and establish woodland trees and hedgerows. 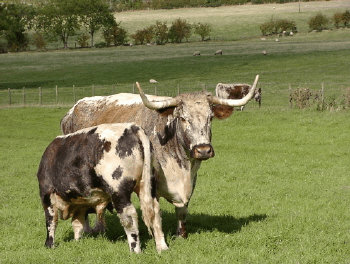 In other places, such as Epping Forest on the other side of London, Longhorn cattle can be found keeping grassland and forest areas grazed as they would have been generations back, a job for which they are particularly suited for, despite their fierce appearance, they are very docile and can be turned loose safely in public areas. Compared with modern breeds however, Longhorns are as tough as they appear. For years they have been left to look after themselves and they have survived without much fuss and attention. They can live well on a plain diet of grass, even if it is rough and coarse, they continue breeding into old age and live long. Giving birth, sometimes difficult for modern breeds, does not trouble these quiet beasts – but the Belgian Blue, a modern breed, can only give birth by Caesarian, a procedure which adds about 50p a pound to the cost of the beef. These speckled beasts are worth a visit. Once they have spent a minute or two looking you up and down they will return to their grazing and will chew their way peacefully around you. Just stand there quietly among them and share their links with history.